Ghain is found growing wild, commonly in the forests of Himachal Pradesh at altitudes ranging from 1,200 to 2,100 metres. It is common, especially on dry and exposed places on the hills. 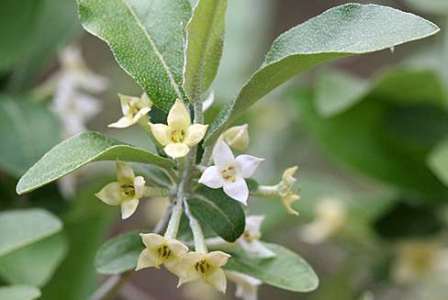 It is a very attractive plant because of its silvery foliage and fragrant flowers. It is also reportedly found in Afghanistan, north China and Japan. 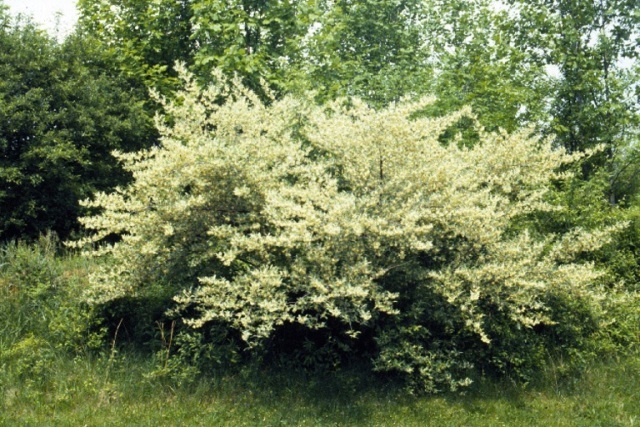 A deciduous thorny shrub, attaining a height up to 3.5 metres; thorns, about 2.6 cm long, bearing a bunch of flowers and a cluster of leaves; bark, removable in longitudinal strips, exposing the white hardwood underneath. One important distinguishing characteristic of this plant is that its shoots and young branches are clothed with very attractive white silvery scales which, however, disappear with the commencement of rains. Leaves, lanceolate, alternate, variable in size, average length and breadth being 2.7 and 1.2 cm respectively, silvery on the ventral surface and hairy on the dorsal surface in the beginning, glabrous at maturity. Flowers, always in axillary clusters, bisexual, fragrant, stalked, white to light yellow, 8-9 mm in length and 7 mm in diameter, perianth, densely scaled, four-lobed, nearly companulate; androecium, comprising 4 stamens, very small, attached to the mouth of the corolla tube; gynoecium, simple, with one pistil, its average length being 7 mm. 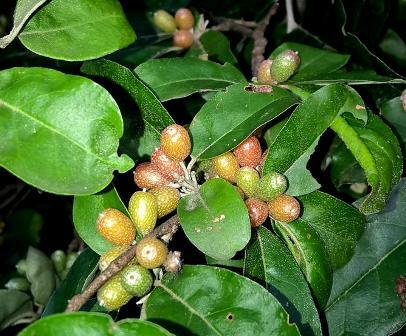 Fruits, ovoid to globose, 3-9 mm in length, 5 mm in diameter, 137 mg in weight, 353 microlitres in volume, epicarp, thin, covering the whole fruit; mesocarp, pulpy and juicy; pedicel, 5 to 6 mm long; freshly picked fruits, coral pink 0619. Seeds, 7-8 mm in length, 2 to 3 mm in diameter, saffron yellow 7/2, 26 mg in weight. The flowering and fruiting season varies with the altitude. Under Solan conditions, flowering was observed to last from the first week to the last week of April. The peak flowering was observed in mid-April. The fruiting season was observed to last from the middle of July to the middle of August. A bush of ghain, covering an area of about 2.5 m2, yields about 650 g of fruits in 2-3 pickings. One 100 g of fruit contains 69.4 g of moisture, 14.5 g of total soluble solids, 1.51 g of acids, 8.34 g of total sugars, 8.13 g of reducing sugars, 0.23 g of non-reducing sugars, and 12.04 mg of vitamin C.
The total mineral content of the fruit, as represented by its ash, is 1.045 per cent. The fruit is rich in protein, which is 4.47 per cent. The percentage contents of some of the mineral elements, viz. phosphorus, potassium, calcium, magnesium and iron, are 0.054, 0.346, 0.049, 0.033 and 0.007 in this order. The seeds and flowers of ghain are said to be used as a stimulant in coughs and the expressed oil is used in pulmonary infections. The flowers are also used as an astringent and in cardiac ailments. The fruit is sweet to acidic and is good to eat along with its seeds. The fruits are very good to eat and are, therefore, liked by all. They have a remarkable keeping quality and can be stored up to 15 days at room temperature. They are very rich in protein and their use should, therefore, be encouraged. The plant is very ornamental because of its silvery foliage and flowers. It is a very hardy plant and grows successfully under dry conditions. It can therefore, be planted as a protective hedge around fields as a well as around houses and gardens.